CAN AM has selected Brown’s as it’s exclusive partner to train students to ride their newest 3-wheel bikes. Successful completion of this course provides the student with the “M” endorsement. All Brown’s motorcycle courses are endorsed by and follow the standards of the Motorcycle Safety Foundation. $99 is what you pay, Can Am pays the remainder of the $290 class. Our most popular course. Students must be 16 years of age or older to take this course. Can-Am Spyders are provided free of charge, and only our Spyders will be used in this 3-wheel course. This course will waive the state written and road exam portions of the Oklahoma requirements for the motorcycle endorsement “M.” Students who have no Learner’s Permit or Driver’s License will be required to pass the vehicle written test at DPS (Department of Public Safety). This course includes 5 hours in the classroom and 10 hours on the range riding the motorcycle. The 10 hours of range time are split between 2 days. Classes will be held, even if it rains. Visit our Motorcycle Training Schedule to reserve your place in a class today! Our Basic Rider Course is designed for the beginning rider or the rider who has been away from riding for a period of time. This course will waive the state written and road exam portions of the Oklahoma requirements for the motorcycle endorsement “M.” Students who have no Learner’s Permit or Driver’s License will be required to pass the vehicle written test at DPS. Students can take this course if 14 years of age or older. This course requires completion of an online eCourse, 5 hours in the classroom and 10 hours on the range. The 10 hours of range time are split between 2 days. Classes will be held, even if it rains. If you have a scooter, you can ride your own scooter. The vehicle must be 500 cc or less. Proof of insurance is required. You must let us know in advance if you wish to bring your own scooter. The fee of $290 is non-refundable and is good for 2019 only. If you have paid for your class you may stop by Brown’s Oklahoma City office and pick up the student workbook. This course used to be known as the Experienced Rider Course (ERC) and is targeted toward the experienced rider who has been riding for at least 6 months. This course will waive the state written and road exam portions of the Oklahoma requirements for the motorcycle endorsement “M.” Students who have no Learner’s Permit or Driver’s License will be required to pass the vehicle written test at DPS. Students 14 years of age or older can take this course. This one day course consists of an online eCourse, approximately 5 hours classroom and 5 hours range. You must ride your own bike. Proof of insurance is required. Trikes are not allowed on our BRC and BRC2 range. Two wheels only. This is a 1 day fun course that could serve as your “warm-up” after a winter lay off. We have riders that take this course on a yearly basis. The fee of $190 is non-refundable and is good for 2019 only. Brown’s offers the Motorcycle Safety Foundation’s newest “Level 2” training in all classes. In the BRC and BRC2 courses Level 2 does REQUIRE that you complete an online eCourse through MSF. The 3 Wheel course does not require the completion of the eCourse. The eCourse MUST BE COMPLETED in order to receive your course completion card and receive your motorcycle “M” endorsement. The eCourse will take approximately 2.5 hours. Brown’s will pay for the course (a $19.99 value). When you pay Brown’s for your class you will receive an email with a payment code and a link to the MSF website. Simply enter the code, complete the eCourse and print your passing certificate. Please bring the certificate with you to class. We discontinue motorcycle training during the winter months because inclement weather affects safety and our instructors’ ability to give our students the finest instruction possible. We look forward to meeting your training needs in the Spring, Summer and Fall. When taking one of our motorcycle courses and after receiving a completion certificate from Brown’s, the state written and road exam for motorcycles will be waived at the Department of Public Safety (DPS). Students who have no Driver’s License will be required to pass the vehicle written test (Permit Test). Information is available in class and on the link below for students without a Learner’s Permit or Driver’s License. Important: Students under the age of 18 who have no Driver’s License need to meet certain DPS requirements when going to take the written vehicle test. Click here for the details. Anyone 17 years of age or younger MUST complete a certified MSF course before adding the “M” endorsement. Any person age 17 or younger no longer has the option to take the written and riding test with a DPS examiner. Please be respectful and attend on the date you have selected. We are asking you to make a firm commitment to attend on the date you select. If you are a no-show for your class a $100 rescheduling fee will apply. If you are late for class, you will be considered a “No Show”, will not be admitted to the class and must reschedule for another class (rescheduling fees will apply). If you change your class date by phone or in person without 48 hours notice, a $50 rescheduling fee will apply. If you reschedule a second time by phone or in person without 48 hours notice, a $100 rescheduling fee will apply. We will not allow you to reschedule more than twice. We are very proud of all our Motorcycle Instructors. We are honored to have moto-journalist and BMW factory-trained off-road instructor Bill Dragoo on staff. You can view his website at billdragoo.com. 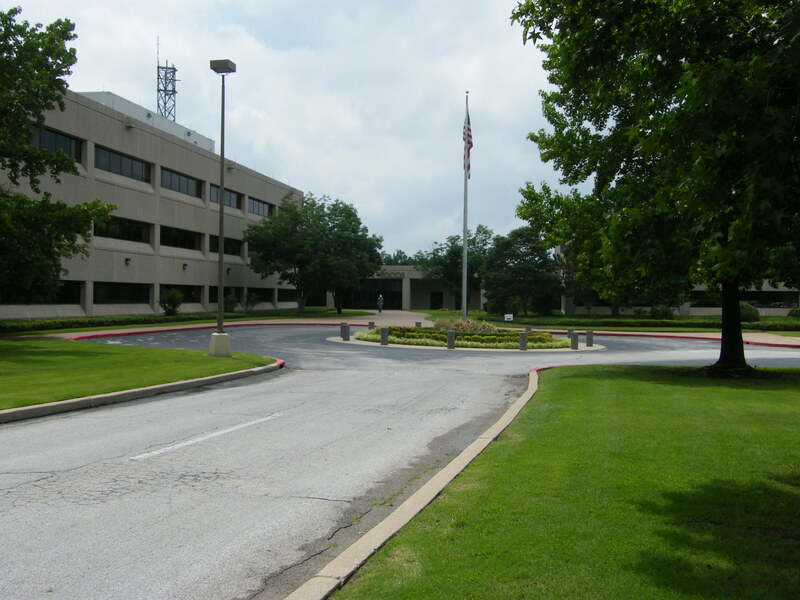 Tulsa Students should enter at the flag pole on the east side of the building.